The Bitcoin Jackpot Faucet is a Bitcoin faucet with a monthly Jackpot drawing, each time you request a dispense from the faucet (1 hour minimum between requests) you will get 300 Satoshi and four jackpot entries for free and each claim adds 100 Satoshi to the Jackpot. 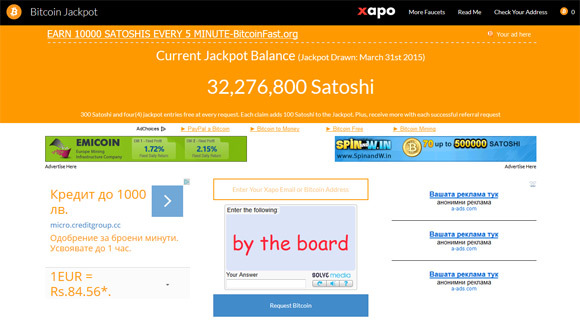 The faucet supports direct payment to a free Bitcoin wallet from Xapo for immediate payment to your account or you can get your earnings collected in your account until they reach at least 10000 satoshi and then get them sent directly to your Bitcoin address. By inviting your friends to use the faucet you can receive 50 Satoshi and 1 entry into the jackpot for each successful referral request, each time they use the faucet and not just once.